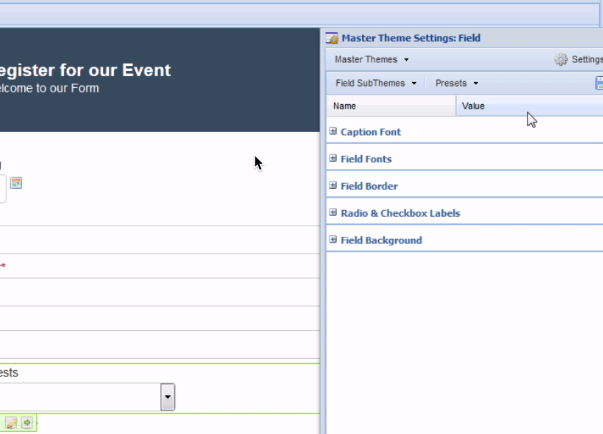 The master theme defines which sub theme and settings are used for each of Page, Panels, Fields, Tooltips and Buttons. When you change the current Master Theme, all of the sub theme settings change to reflect the new master theme. Master themes are accessed from the Theme & Style menu choice in the Form Designer. Roll over each thumbnail image to see a larger view. There are 14 themes available to choose from. After applying a master theme, you can click Settings, and choose from the different sub theme types to edit settings for each sub theme. When you make a change to the settings of any theme (a theme that's not part of an adhoc theme), the menu selection for master theme changes to Custom. This indicates that you are using custom settings and not one the default settings or one of your previously saved Master Themes. Theme settings are committed when you save your form. Click the menu item Save Current Master Theme. Enter a name for the master theme. To update an existing master theme, enter the name of the existing theme. You may now find the present in the Master Themes > Your Custom Master Themes menu.